Finding time for exercise as a new mom: It’s possible if you do these things! It can be hard to schedule some time for exercise as a new mom. You can’t do it when the baby is hungry, and what if they cry while you’re trying to burn some fat? To get you on your way to reclaiming your pre-baby body, here are some nuggets of wisdom you can use. It’s super tempting to hit the snooze button in the wee hours of the morning, especially if your baby was up all night. But setting your alarm 40 minutes ahead of your routine can allow you to squeeze in a quick 20-minute workout before the day starts. It’s also better to get it over and done with as early as possible before you start making excuses later in the day. Working out before everyone else in the house does gives you some time for yourself, and it’s a great way to start the day! Okay so you barely have time to scarf down a meal, so how the heck are you supposed to fit a workout into your routine too? Here’s a motto to live by: start small and just do something. You’re either doing something, or you’re doing nothing at all. And the choice is totally up to you. If you can’t commit to a full workout today, it’s OKAY. Break things up into 1-minute sessions and work your way up as you ease into the whole motherhood thing. You can get slim without the gym, and for most new moms, this is the only option. 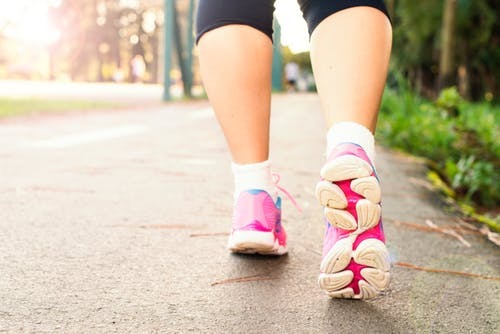 You’ll find it hard to set foot outside the house some days, which is why finding time for exercise as a new mom is much easier done on home turf. Regardless of how much time you’re investing, your goal has to stay at doing SOMETHING instead of doing nothing. Whenever you have some spare time, put your baby in the carrier or sling (or stroller) and head out for a quick walk. If your baby is older than six months, you can even pick up a jogging stroller and try some sprints. For now, the goal is to take things slow at a relaxed pace. Once you’ve put your little one to bed, you have a golden window of opportunity for working out. Find something you can do in the comfort of your own home that spans across no more than 20 minutes to end the day off on a high. It’s the best pre-Netflix and slipper activity to set the mood for the evening.